The future of cassava, one of Africa’s most promising and climate-resilient crops, may be under threat if efforts to renew the fight against diseases affecting the plant are not renewed, the European Union (EU) and the UN Food and Agriculture Organization (FAO) alert. The call for renewed investments of USD 100 million by governments and partners is the outcome of a regional event held in Nairobi, Kenya, this week attended by over 70 regional cassava professionals. Over the past four years the Regional Cassava Initiative, funded by the EU and coordinated by FAO, has restored cassava yields and improved the food security situation of over 500,000 people in East and Central Africa. 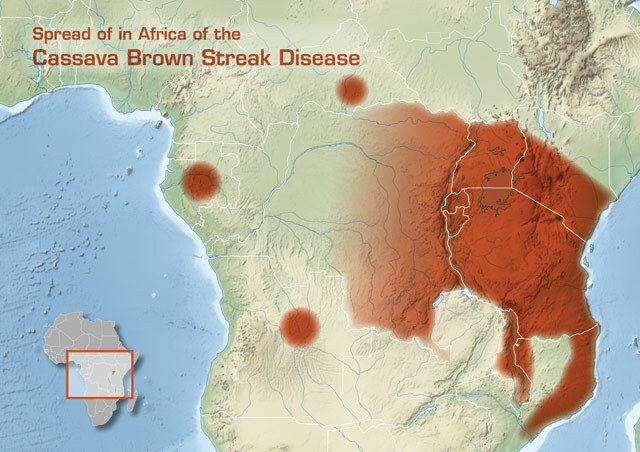 But while Cassava Mosaic Disease (CMD) is being contained, Cassava Brown Streak Disease (CBSD) is rapidly spreading, posing a major threat to the food security of 135 million people in the region. During the Regional Cassava Initiative’s closing workshop ‘Upholding cassava’s potential in Africa’, over 70 experts from across Africa gathered to take stock of achievements made by the project and elaborate on the way forward in addressing the threat. Under the project, which was coordinated by FAO Subregional Emergency Office for Eastern and Central Africa, disease-tolerant or resistant cassava varieties were grown and clean planting materials made available to Aoron and other farmers. The accessibility of surveillance information was improved and newly established national cassava commissions now ensure movement of cassava vegetative material is better regulated. “Cassava is moving up the national policy agendas. Uganda has already identified the plant as a priority crop under the development strategy investment plan of the ministry of agriculture,” added Patrick Seruyange, European Union’s project lead, “We are now calling upon all local governments and development partners to further support interventions along the value chain. At least half of all plants in Africa are affected by cassava diseases. A renewed investment of minimum USD 100 million is needed to further support clean farm production, coordination, regulation, disease surveillance and research as well as market and micro finance development across the whole cassava value chain. If not achieved CBSD is likely to reach Nigeria, the biggest cassava nation in Africa, and its impact on food security will be immense. Without renewed commitment cassava’s future potential in Africa is under threat.